The first 23 years have been amazing. Led by a talented, enthusiastic, and dynamic Executive Director, Aggie McCormick-Dix is realizing a dream of providing enormous opportunities for the youth of our community, and in doing so, also teaching about character and citizenship which is all a part of the vision…“striving for excellence…on and off the court!”. The history is rich…the impact has been dramatic..and the future is extremely exciting and bright! GO STARS!! 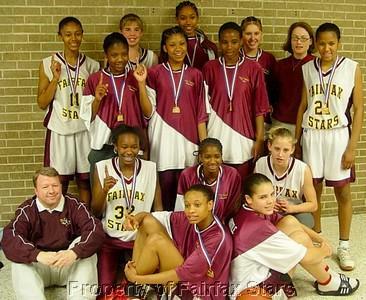 After founding the Fairfax Stars in 1996, the program began competition with boys and girls teams in 1997. Since that time, there have been many championships, however more important is the faithful adherence to the commitment to teach participating athletes fundamental skills and knowledge of the game of basketball, and supporting every student-athlete in the pursuit of their dreams. The relationships that have been built with players, parents, and families over these years is an enduring testimony to the fulfillment of the dream that Aggie implemented more than two decades ago. Thank you to all of the volunteer coaches that have dedicated their knowledge, energy, enthusiasm, and love to supporting so many young players over these years. Looking forward to a future that continues to prepare young people to compete in life. For more information about this outstanding program, please contact us at fairfaxstars@aol.com. Aggie McCormick decided to move boldly to pursue a dream that she had to start an AAU basketball program that would offer more opportunities for community youth. U10 Girls compete at the U10 Girls AAU National Championship that is played at the newly opened Disney’s Wide World of Sports in Orlando, Florida. The girls claim two national championships and a 5th place finish. The boys had several teams finishing in the national top 20 in their respective age groups. Fairfax Stars produced the first national championships on the boys side as the 13 year old boys-gold team cinched the 2005 AAU Division II National Championship. Fairfax Stars were ranked as the 6th best AAU girls basketball program in America and the boys program remained in the top 20. The Fairfax Stars girls program was ranked as the #3 program in America, and the boys continue to be a top 20 national program. Fairfax Stars Team Showcase launches to give kids college exposure. Fairfax Stars girls and boys programs are recognized as one of the top AAU organizations in the nation. The Fairfax Stars girls win two national championships. The boys had several teams finishing in the top 20 in the nation.